This is what has been blooming the past few weeks. As enjoyable as the fruits of a garden are, most days a gardener experiences a lot of frustration and set backs. It definitely requires stamina, patience, and sometimes courage to garden. We've had such a wet, humid summer resulting in masses of gnats and mosquitoes that it's impossible to even step outside without first bathing in Deet. Then of course there are always the deer, rabbits, squirrels, and gophers who are intent on destroying your Eden. And because I live in the country near a river, I have plenty of snakes to startle me. But perhaps worst of all is the bees! I've been stung by bees many times as a gardener and I have learned from experience how to work around them and to have plenty of Benydrl on hand for emergencies. Yesterday however there was nothing I could do to avoid being stung. I was working at weeding a garden edge and I pulled some grass up in the process unearthing a hive of ground bees who stung me multiple times. I was so upset! It was a perfect gardening day, cool, cloudy, and in the sixties. I was looking forward to a long day in the garden to get some heavy labour done that I can't normally do in the summer because of the heat and humidity. I wasn't outside longer than five minutes when I was stung and I ended up spending the rest of the day indoors covered in ice packs! My husband destroyed the hive when he got home. No, they weren't honeybees. And sorry to all the bee-lovers out there, but it was too dangerous to leave that ground nest where it was and there's no way to relocate a hive of bees who nest in the ground. Not that I know of anyway. Today, I feel better (thank goodness I took that Benydrl the minute I was stung), but I will still be spending the day indoors nursing swollen and itchy limbs. In the meantime, I will enjoy the view from my window and writing this garden post. Here is what has been blooming in my garden the past few weeks. 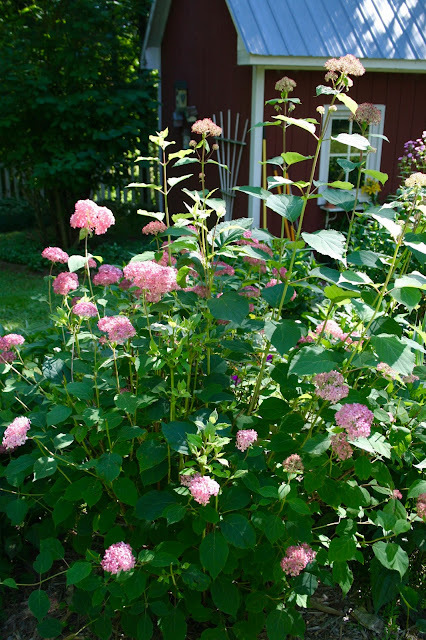 This is an Endless Summer Hydrangea. You may have seen this variety in a blue version, but mine blooms pink because of my soil. 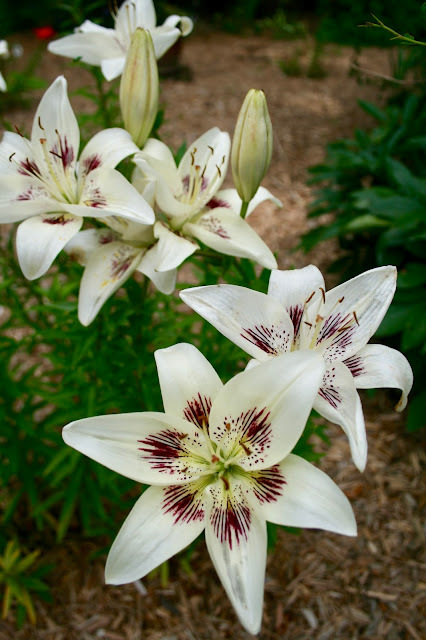 What type of soil you have determines the color of the blooms. 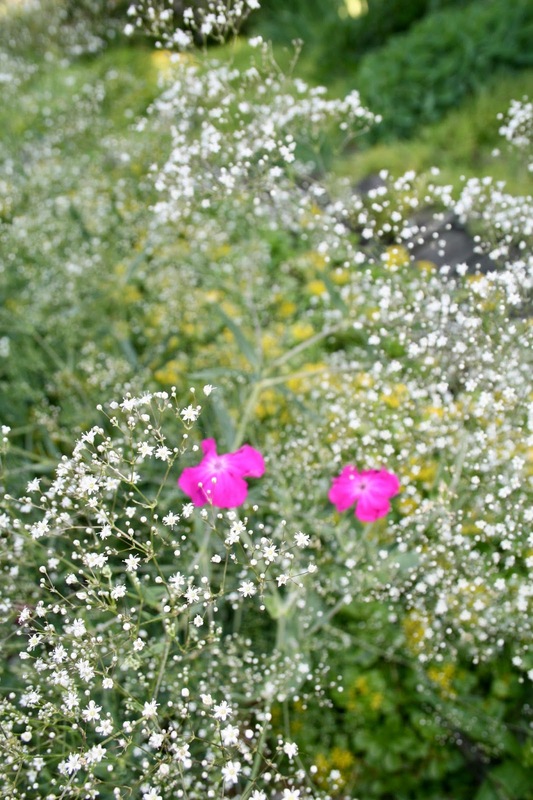 I've been working very hard at removing tall phlox from my garden because it reseeds everywhere plus because I have mostly a part shade to full shade yard, it gets covered in powdery mildew. But I did leave a few sprigs here and there and this is one of them. 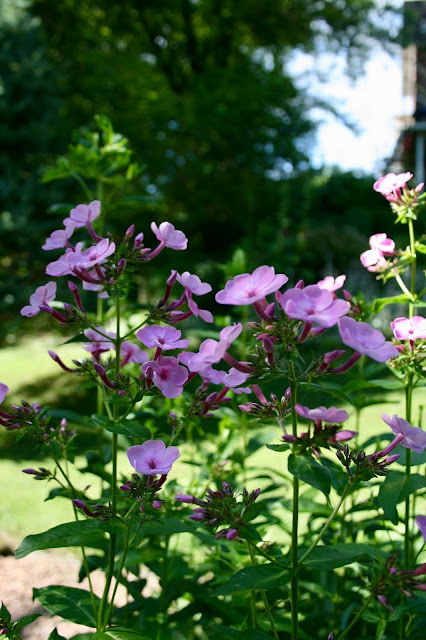 The phlox is just about to bloom, and should be in full bloom within the next few weeks. All the tall Asiatic Lillies are in full bloom now so my garden is a riot of bright bold colors like red, orange and yellow. 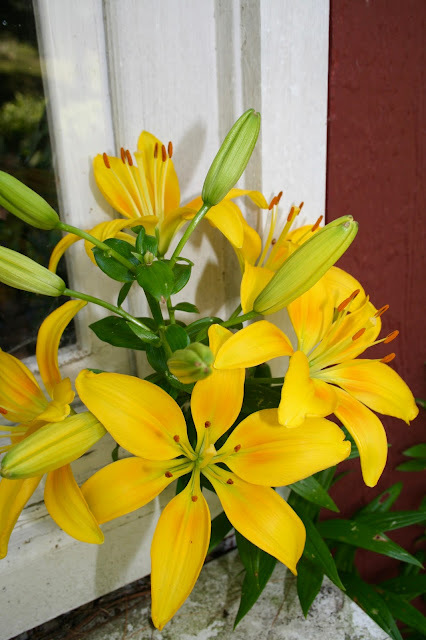 This is a yellow lily that I dug up and put it in a pot till I could move it elsewhere in my yard, and would you believe it bloomed right in the pot totally neglected! These perennials are so hardy! 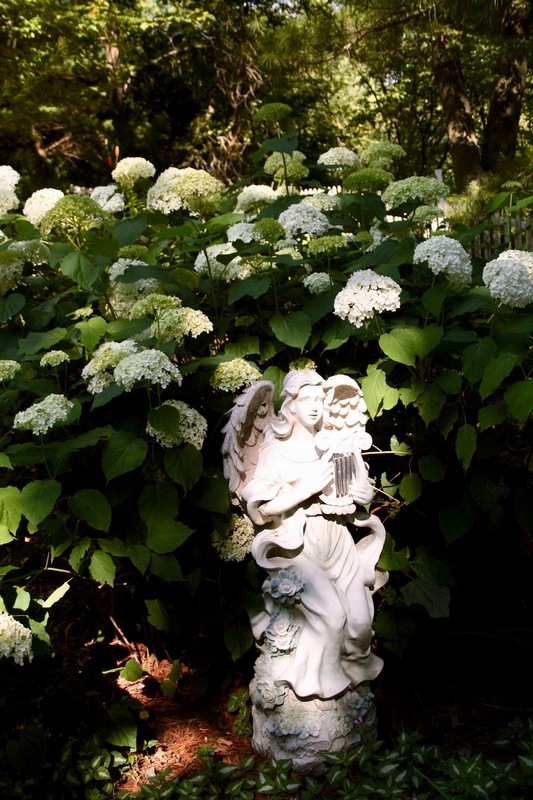 My Annabelle Hydrangea gets bigger and bigger every year. I had no idea this bush keeps spreading with underground runners. Pretty soon it will take over my entire garden! Maybe next year I will dig up some of the runners and move it to my fence line. It's one of the few flowering bushes that thrives in full shade. In my last garden post I showed you my "Little Princess" Spirea Bushes. Now I have a hotter pink variety in bloom! I have about four Baby's Breath plants in my yard. They don't contribute much to a landscape, but I love having the pretty sprays available to make floral arrangements. 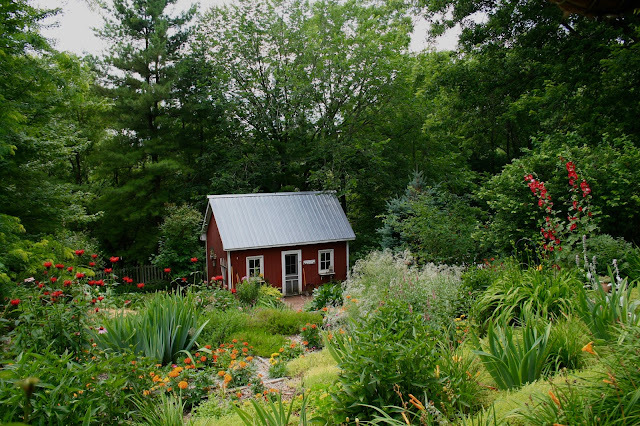 If you look towards the center of this picture, just to the right of the garden shed, you can see this same Baby's Breath plant. 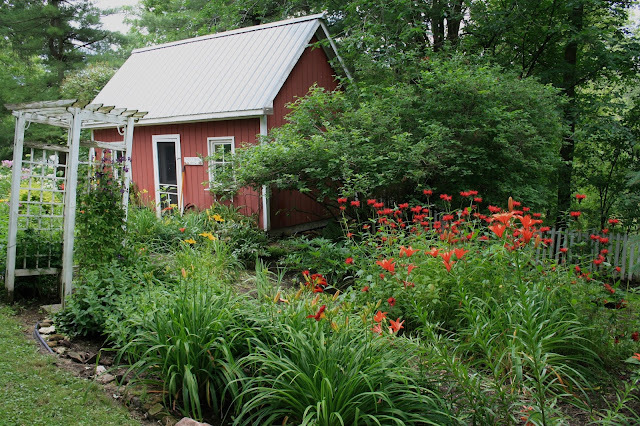 Other flowers in bloom in this garden are Bee Balm, Marigolds, Hollyhock, and Day Lilies. Here is a close up of that same Hollyhock plant. 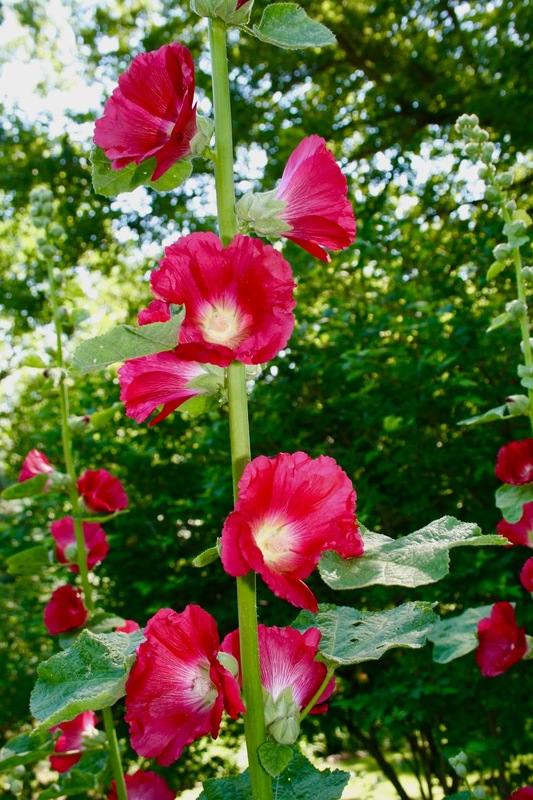 I use to have a lot of Hollyhocks in my garden, but they are Biennials and if they don't reseed they die away. Now I have only a handful in my garden, all this same rose pink color. But I hope to add some more once I'm done renovating my large sun garden. 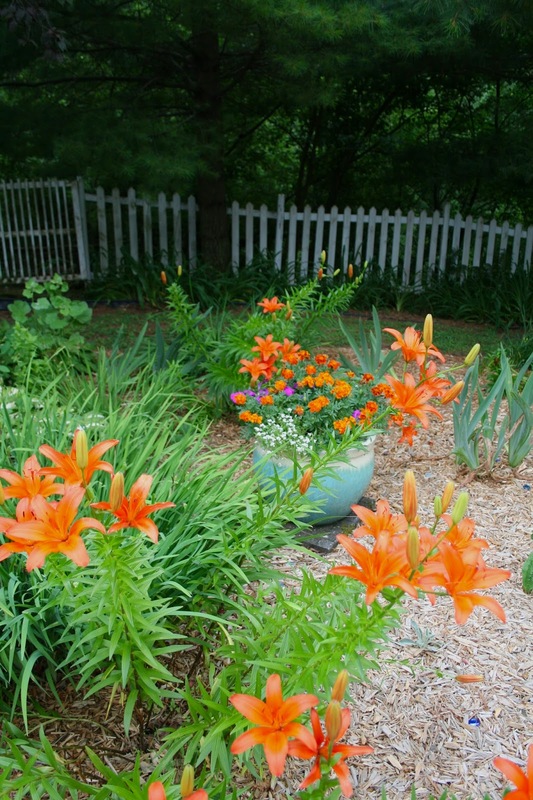 The tall orange Asiatic Lilies are the stars of the Mid-July Garden. 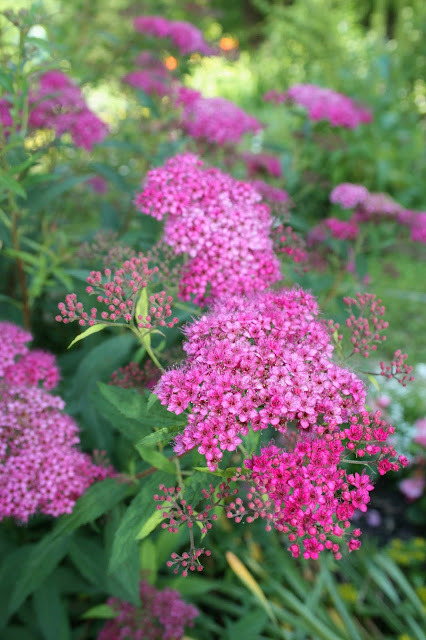 They are so hardy and prolific that I just keep dividing and replanting them so they are all over my yard. 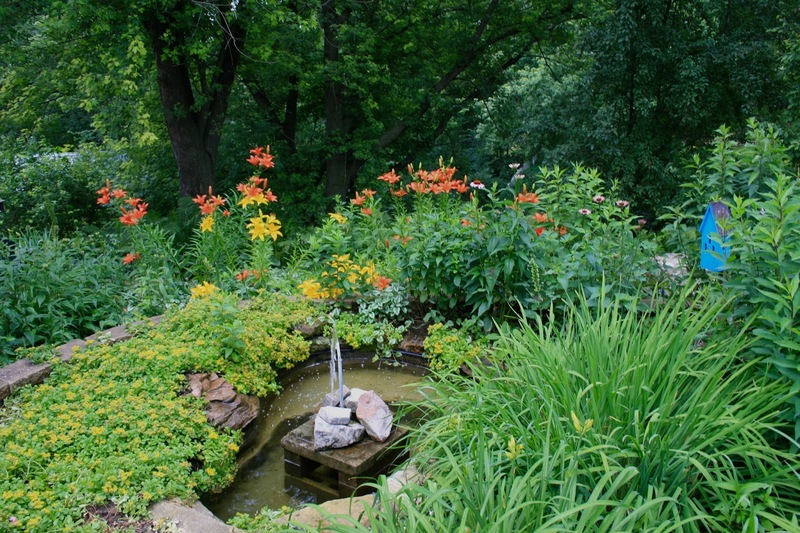 When choosing annuals to plant among my perennials, in addition to picking durable plants, I picked them considering what colors would go best with the colors already in my garden. Marigolds are the perfect annuals. They are left alone by animals, and their bright yellow and orange blooms go great with my lilies, cone flowers, and bee balm. 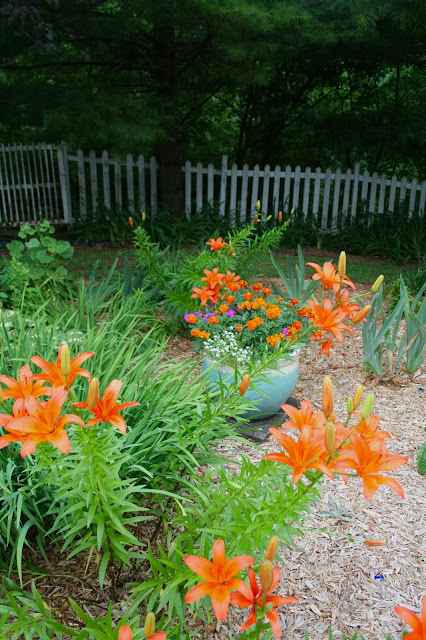 Here you can see lots of orange Asiatic Lilies dotting this newly renovated garden. 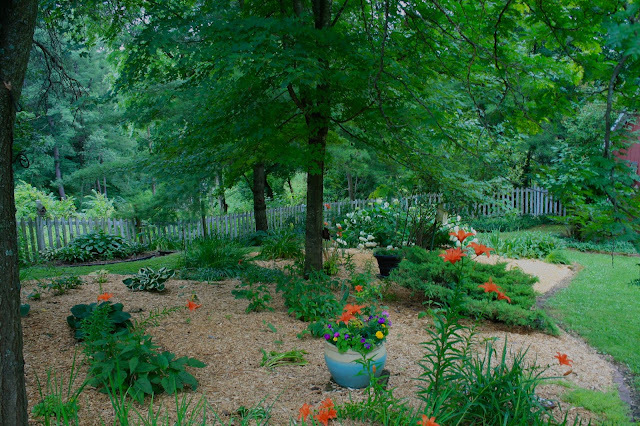 This is a shade garden too! Although they grow best in full sun, they will survive in a shade garden as well. And here is a close up of this hardy beauty. I also have them growing next to my pond, but they are really taking over. This is a garden that definitely needs to be redone next year! I also had a white lily bloom this week. Isn't it pretty? It's so unique with it's eggplant spray center. This garden is my current project; my large sun garden. I have it 3/4 of the way weeded and thinned out, but only about 1/4 mulched. This was the garden I was going to work in yesterday until I was stung by bees! UGH! Anyway, the Bee Balm is the star of this garden. It has spread to such a large clump, but I really like it, so I'm leaving it as is. My favorite day lily is planted in front of the bee balm. Here is a close up of my favorite day lily. It has huge blooms, and I love it's bright red color with the bold yellow center. And finally, here's a picture of my brave husband putting on our new steel roof. He does one section of the roof per year, the right side of the roof pictured below was done last year. He has two more sections to go, but the other side of the house is no where near this height so it will be a lot safer for him to do. Our house is built into a hill which is why one side is so much taller than the other side. 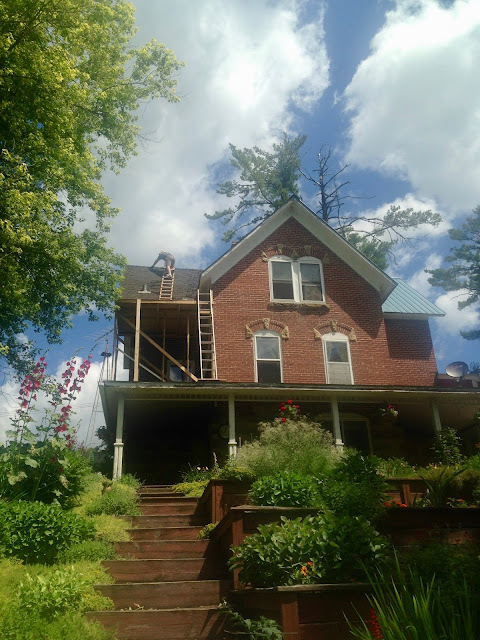 The nice thing about putting on a steel roof verses the traditional shingles, is that he'll never have to do this again! I think it depends where in America you live...we have so many different climates here from desert, to tropical, and everything in-between. I live in the midwest and our climate is more similar to yours except we have hot and humid summers and our winter is probably a lot colder too! 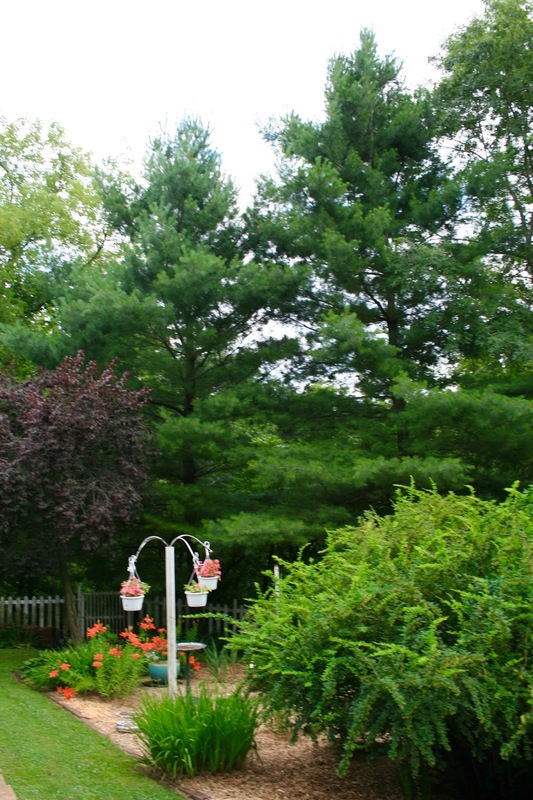 Beautiful photos and your garden is fabulous!